What is "ICOCA & HARUKA"? 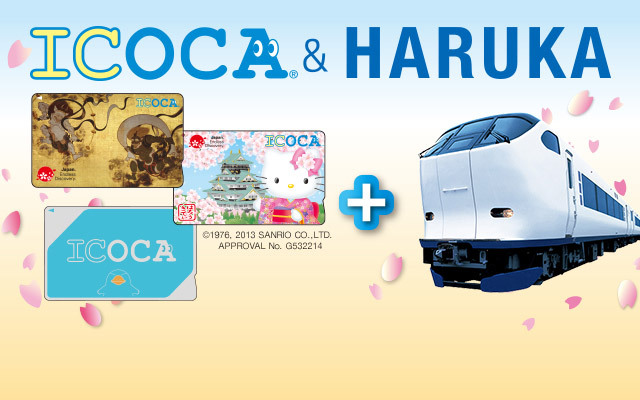 The Kansai Airport Express "HARUKA"
"ICOCA & HARUKA" is a set containing an "ICOCA" IC card (pre-charged with 1,500 yen) and a discounted ticket for the Kansai-Airport Express "HARUKA." The ICOCA can be used on JR, subway, private railway and bus transportation and for shopping in the Kansai Area and beyond. 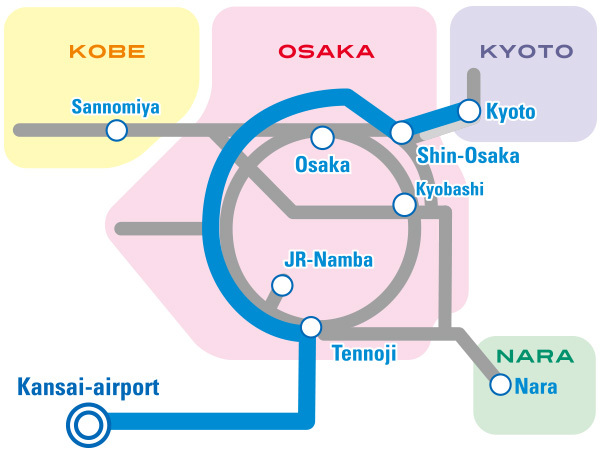 The Kansai-Airport Express "HARUKA" provides direct access from Kansai-airport Station to Tennoji, Shin-Osaka and Kyoto Stations. If you already have an ICOCA card, you can purchase "HARUKA discount ticket" without buying new ICOCA! Special offers are available at 150 shopping facilities and tourist spots. 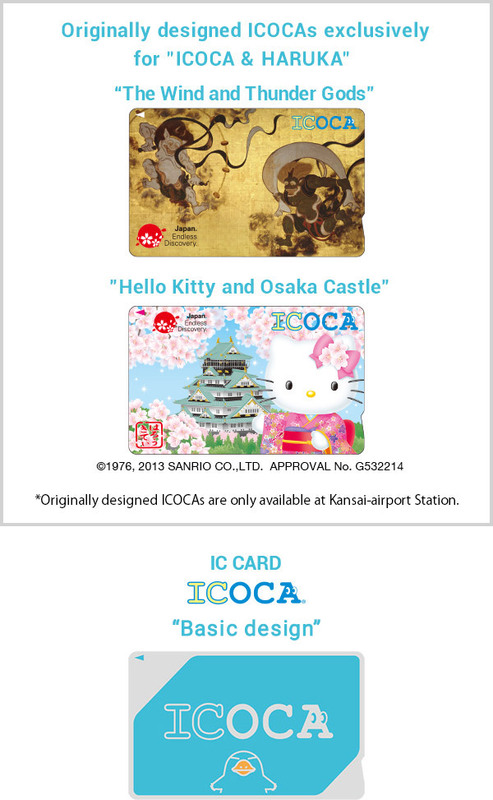 please select "KANSAI ONE PASS" for "Number of ICOCA cards for each design" in the application form. 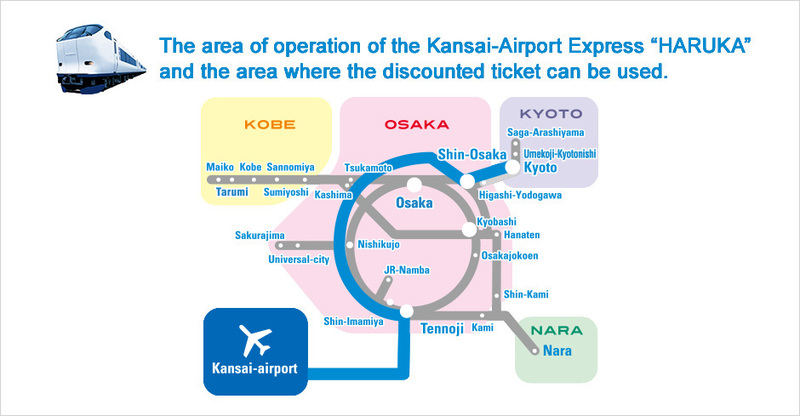 Submit an application for purchase to the staff when picking up the Kansai One Pass at Kansai-airport Station. * Kansai One Pass cards are selling at 3,000 yen each (including a 500 yen deposit). Please note that this price makes Kansai One Pass cards 1,000 yen more to use than other ICOCA cards. * You can choose between two types of "ICOCA & HARUKA": one-way and round trip. 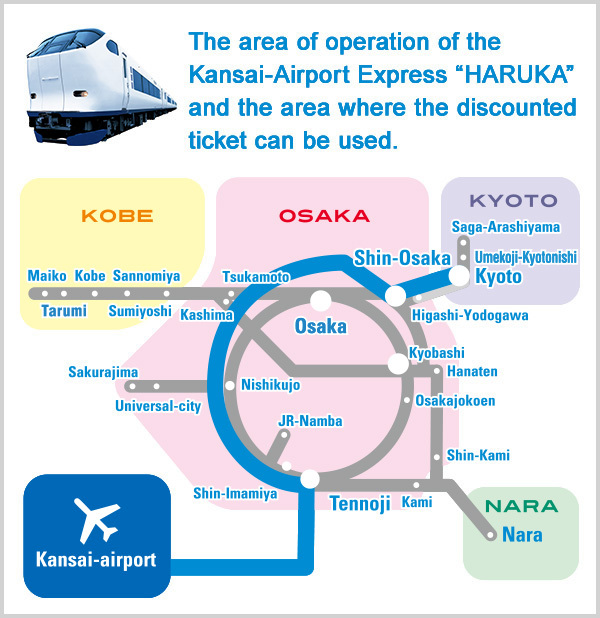 * There are one-way "ICOCA & HARUKA" tickets from the Osaka/Kyoto/Kobe/Nara area to Kansai-airport Station. However, they are available only in Japan, and they cannot be reserved online. Only for Adults(12 years or older). No price settings for children. Usage for children: The Kansai Area Pass (starting at 1,100 yen) is available for various services, including between Kansai-airport and Kyoto Station. *If you have a ICOCA card, you can purchase "HARUKA discount ticket" only. 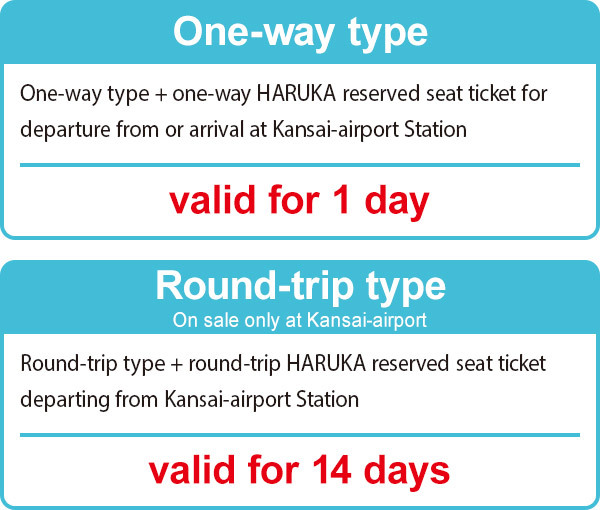 Regarding one-way tickets arriving at and departing from Kansai-airport, a visitor may purchase only 1 ticket each. A combination of one-way ticket and round-trip ticket is not allowed, either. Group: Please let a representative bring passports of all members to purchase all. "ICOCA & HARUKA" user must be holding a passport issued by a foreign government. "ICOCA & HARUKA" user must be entering in Japan as a "Temporary Visitor". Use our handy online reservations system to reserve "ICOCA & HARUKA" before you leave home! Online booking are available for "ICOCA & HARUKA." * JR-WEST ONLINE TRAIN RESERVATION will replace JR-West’s Online Booking service in mid-May (scheduled). * Ticket prices and how tickets are reserved/received will change accordingly. We appreciate your understanding. * You can receive reserved "ICOCA & HARUKA" at Kansai-airport Station. * You cannot use online booking for "ICOCA & HARUKA" from other stations to Kansai-airport Station. Please buy your tickets directly at a JR station after you arrive in Japan. Online booking can be made from 27 to 2 days before the start date of use. It is not possible to make reservations more than 27 days in advance. Payments for "ICOCA & HARUKA" reserved online can be done at Kansai-airport Station after arriving to Japan. Please pay in cash when collecting your "ICOCA & HARUKA" (credit cards not accepted). ICOCA card is a smart card issued by JR-WEST. You can use ICOCA for shopping inside and outside stations. 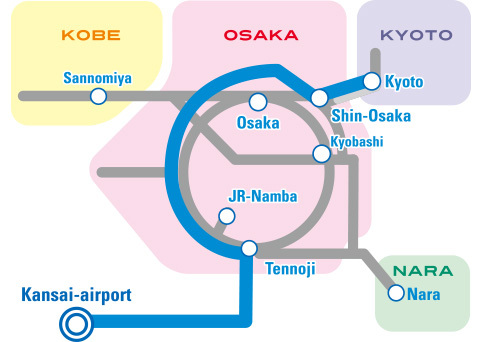 The Kansai-Airport Express "HARUKA" is a convenient and comfortable limited express train which directly links Kansai Airport with stations in the major cities in Kansai such as Tennoji, Shin-Osaka and Kyoto. 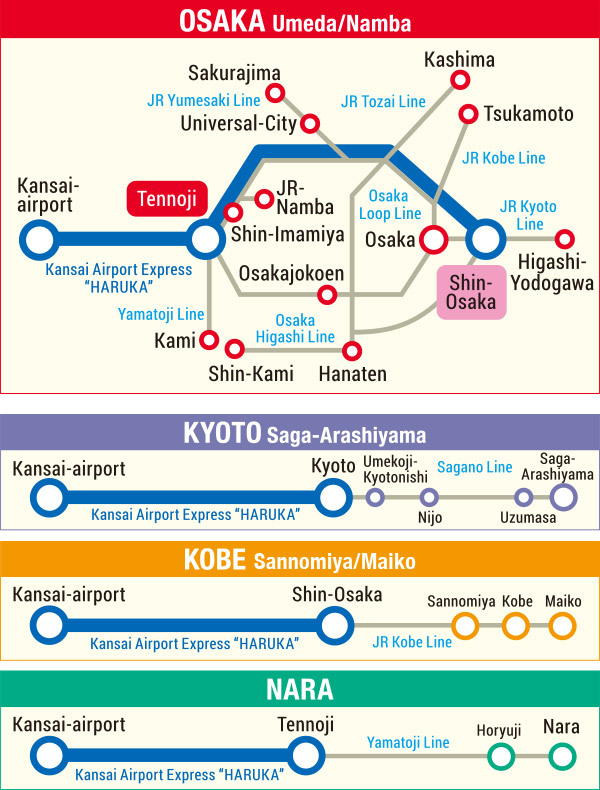 From Kansai-airport Station, it takes approximately 35 minutes to Tennoji, 50 minutes to Shin- Osaka and 80 minutes to Kyoto. Sixty trains (30 round-trips) run every day. * This is the new number of trains after the timetable was revised on March 17, 2018. * The HARUKA tickets included in "ICOCA & HARUKA" cannot be used to board any other Limited Express trains besides Kansai-Airport Express "HARUKA". * Within the limits mentioned above, it is possible to board other trains besides the Kansai-Airport Express "HARUKA", such as Special Rapid Services, Rapid Services and Local trains. * Please note that the Limited Express non-reserved seat fare cannot be refunded if passengers use a train other than the Kansai-Airport "HARUKA". * It is possible to get off the train at other stations within the area of usage. However, this is not a ticket for unlimited rides, and it will be collected when you pass through the ticket gates. * Additional fees apply when using trains outside the area of usage. * When taking a reserved seat or boarding a first class car（green car） on the Kansai-Airport Express "HARUKA", an additional Limited Express fare is required. * Separate fees apply when using a car or train where numbered boarding tickets or liner tickets are required. 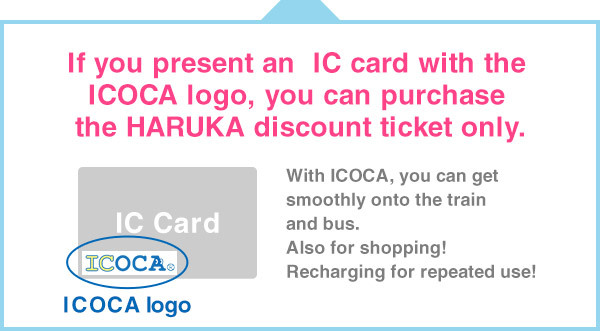 If you do not claim the refund for your ICOCA card and take it with when you return to your country, you can bring it with you on your next trip to Japan and purchase a "HARUKA discount ticket" only. * It is possible to receive a refund for the ICOCA card. 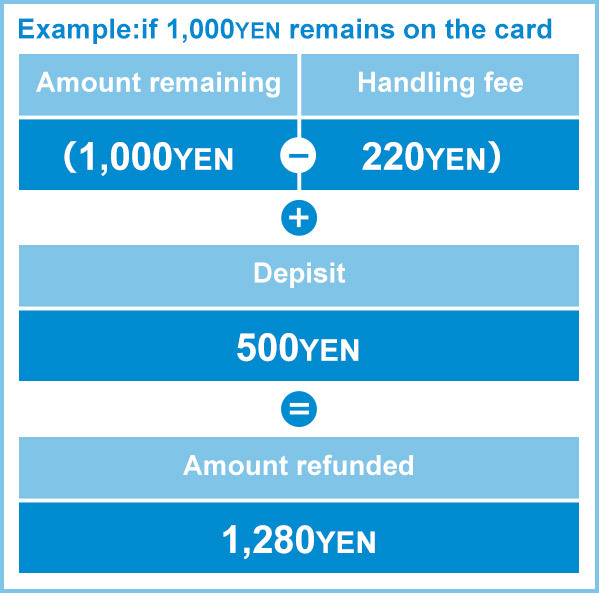 * A handling fee 220 yen will be deducted from the amount of money remaining on the card. * The 500 yen deposit will be returned. You cannot keep "ICOCA & HARUKA" if it is returned for a refund. Refunds for "HARUKA discount ticket." * You can get a refund by paying the service charge of 440 yen for the one-way ticket (660 yen for the round-trip ticket) at sales places of "ICOCA & HARUKA" as long as the ticket has not been used and is still within its validity period. 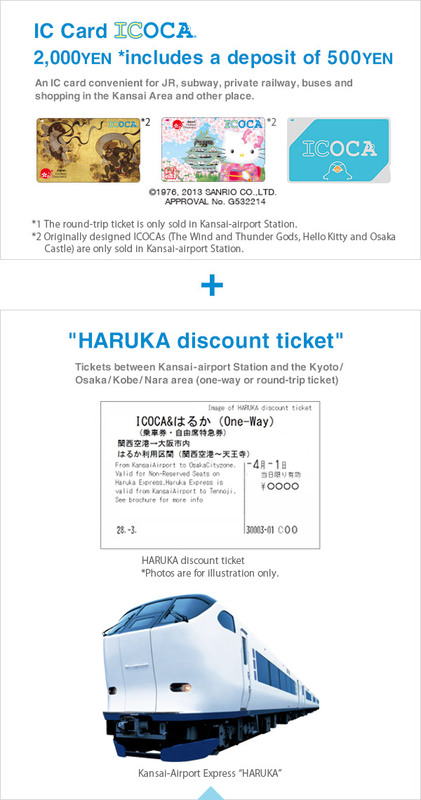 "ICOCA & HARUKA" departing from Kansai-airport Station (one-way and round trip) can be reserved online. * You cannot use online booking for "ICOCA & HARUKA" from other stations to Kansai-airport Station. Please buy them directly at a JR station after you arrive in Japan. *Online booking can only be used for reservations where Kansai Airport is the starting point.